AFTER he obtained his PhD in mechanical engineering from the Southern Methodist University in the United States in 1999, Ukraine-born Vladimir Kulish received offers to teach and conduct research in various countries. These included universities in France, Germany and Singapore. The academic, who became a Russian citizen at the age of 12 and lived in Moscow, eventually decided to join the Nanyang Technological University's (NTU) School of Mechanical and Aerospace Engineering. After almost eight years here, Dr Kulish, 40, sounds like just another pragmatic Singaporean. In fact, he proudly lays claim to his Singapore connections: His son was born here six years ago and his daughter married a Singaporean last December. Dr Kulish is one of about 600 Russians working, studying and living here. This is up from about 500 in 2004. Granted, this is a relatively small number, given that there are 875,500 foreigners based here. In comparison, there are an estimated 35,000 Indian expatriates and 15,000 Americans here. But the number of tourist arrivals from Russia tells a different story. The figure has more than doubled in the last five years, from 15,900 in 2002 to 37,700 last year. Mr Aleksey Tkalich, 28, whose travel agency Han Kang Travel Service in People's Park Centre specialises in bringing in Russian tourists, says most of his customers are businessmen in their 30s and 40s and their families. They like to relax at luxury hotels in Sentosa for up to 10 days, with many making repeat visits. 'Russians are curious about this miracle called Singapore and how the country grew so fast. After all, as an independent republic, Russia is pretty young itself,' says freelance Russian tour guide Ludmila Semenova, 48. Russia is Singapore's 38th largest trading partner, with bilateral trade totalling $1.32 billion in 2005. And the Russian presence is set to grow, given the closer ties between both countries. One positive result of this is the symphony, Singapore: A Geopolitical Utopia, which will premiere here at the Esplanade tomorrow. It was not written by a Singaporean, but by a Russian composer, Vladimir Martynov. It is commissioned by the Singapore ambassador to Russia, Mr Michael Tay, and the performance is the opening event of the second Russia-Singapore Business Forum. It was first performed in Moscow in October 2005 as part of Singapur Po-Russki (Singapore In Russian), a month-long festival that featured Singapore food and a visit by Minister Mentor Lee Kuan Yew. The work was performed by the Vladimir Chamber Choir and Vladimir Governor's Symphony Orchestra then. It will be performed here by the Singapore Symphony Orchestra (SSO) and Moscow's Vasiliev Choir. THE Russian community in Singapore is diverse, ranging from students to musicians, bankers, businessmen, tour guides and academics. In the SSO alone, there are six Russian musicians. There are also at least 20 teaching and research staff members at the local varsities, as well as some PhD students. They hail from all over Russia as well as other republics of the former Soviet Union. Attracted by Singapore's safe yet vibrant environment, they started coming here from 1991. That year marked the collapse of communism and the opening of borders in Russia, which has a population of about 148.2 million. A Russian embassy official says the average Russian in Singapore would have at least a university degree, be fluent in English and have some achievements in their professional fields. He adds that the embassy's bar and pool complex is open for registered Russian citizens during weekends and is quite popular. Every Saturday afternoon, there is a volleyball match between the Russian expatriates and the embassy staff, followed by a beer party. 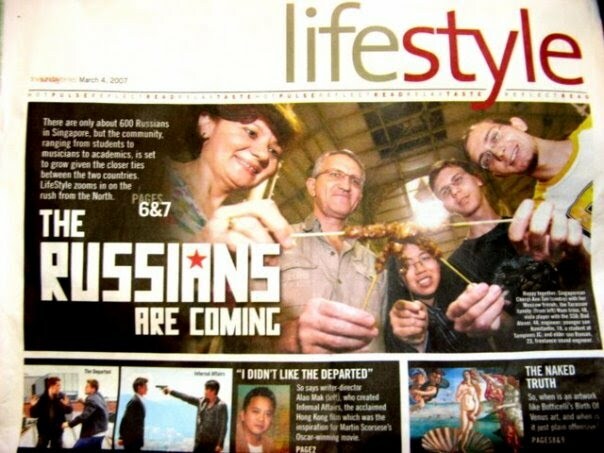 LifeStyle understands that some Russians here have become permanent residents and Singapore citizens, with a handful who have even done their national service. Most of them live in condominiums, eat at hawker centres and send their children to international schools as well as local schools. One Russian who has made Singapore home - at least temporarily - is housewife Tatiana Pozen, 35, who lives in an apartment in Clementi with her two daughters and Malaysian engineer husband. They came to Singapore a year ago after living across the Causeway since 1996. Her 10-year-old daughter attends Clementi Primary School and has both local and foreign friends. 'I don't send her to an international school because local schools are good enough,' she says. While she likes Singapore for being well organised, she finds that, like any other major city in the world, it is a little too crowded and noisy for her liking. Another family that has happily settled here are the Tarassovs. Dad Alexei brought Mum Irina and sons Roman and Konstantin here nine years ago, when he got an engineering job offer. The family has grown so comfortable with life here that they have yet to step into a Russian restaurant. Plus they now share that favourite Singaporean pastime - shopping. 'I especially love Junction 8,' Irina says. EVEN Singaporeans are doing their part to promote relations between the two countries. One such person is Cheryl-Ann Tan, 22, who founded the Singapore-Russia Exchange website in 2001. Also known as 'Anya' to her Russian friends, she spent three years working in Russia after her A levels, before returning late last year. As someone who 'has always been interested in Russia's history', the freelance writer started the Exchange as a portal for people to make friends, as well as to provide useful information for Singaporeans moving to Russia and vice versa. Now she's considering going commercial with the website, to tap into the growing economic ties between the two countries. And slowly but surely, more Russian students are also making their way to Singapore. Mr Tkalich, who also arranges short-term English courses at private schools for students, says that during summer between June and August, there could be about 30 of them in Singapore. Most of them are from far-eastern cities like Vladivostok and Khabarovsk. He estimates that there are another 50 Russians holding student passes here, with the majority of them being tertiary students. Studying here costs about US$2,000 (S$3,055) per month. 'Sometimes, it's cheaper to come to Singapore than to travel to Moscow or other European countries,' he says. He adds that it takes the same amount of time - eight hours by air - travelling from the far east of Russia to Singapore, as it does to Moscow.